There was plenty of pink to go around the Robert M. Collins Center Gymnasium Oct. 15 when the Triton College volleyball team was one of thousands of schools who participated in the Dig Pink® National Breast Cancer Awareness Rally. The Lady Trojans met their goal of raising $1,000 for The Side-Out Foundation, a national 501(c) (3) non-profit organization which supports health care professionals in their pursuit of practical solutions for women and men diagnosed with breast cancer. 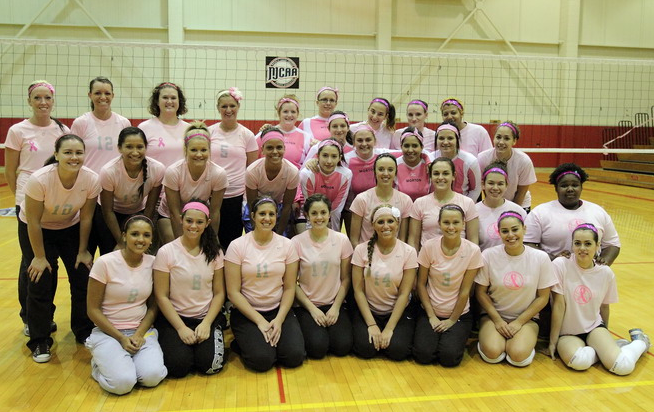 Triton competed in a Tri-match against both Danville Area Community College and Morton College, as all three teams wore pink jerseys and took a group photo prior to the first match as a sign of unity in the fight against breast cancer. The Lady Trojans raised $780 the day of the event through admission, selling pink t-shirts and raffling prizes. However, the most popular event of the day was the serving target game between the second and third set of each match. For $2.00 a serve, spectators had the chance to serve at targets for various prizes, including numerous gift cards to many area restaurants and businesses. The serving game was such a big hit; the team brought it back during their final home game Oct. 20 vs. College of DuPage to help achieve their fund-raising goal. Photo credit, Johnny Boston: Picture is a group shot of the Triton, Danville and Morton volleyball teams.